TUCSON, Ariz. - Do you ever want to be driving around in circles? Traffic engineers say sometimes traffic is faster and safer that way. Traffic engineers see a lot of benefits from traffic roundabouts even if drivers are not so sure. To traffic engineers, a roundabout is a smooth way to move traffic quickly and safely. A roundabout is not the same thing as a traffic circle. Retired Pima County transportation director Albert Letzkus says in a traffic circle drivers in the circle yield to drivers entering. He says, “But the concept of a modern roundabout is the drivers within the circle are allowed to move freely, and the drivers entering the circle have to yield." Most of the time drivers can merge without stopping. They can't do that at a normal intersection. Traffic engineers say if you do get in an accident in a roundabout you're less likely to be badly hurt because it's more likely to be a slow-speed side-swipe. But if you get in a wreck in a regular intersection it's more likely to be a high speed broadside. 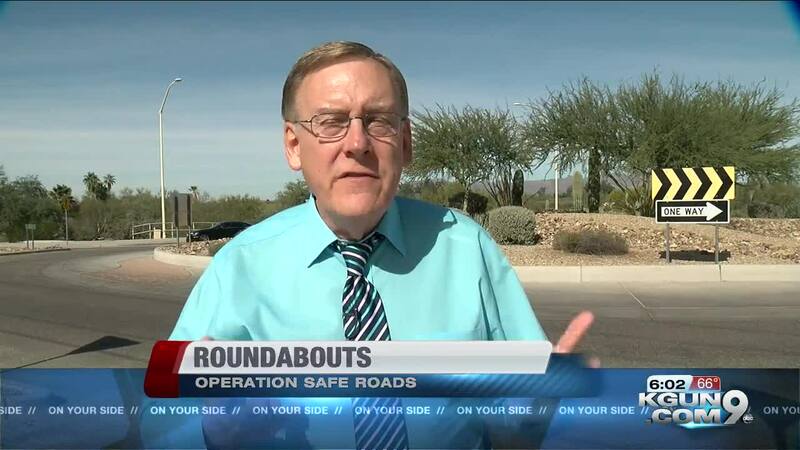 Pima County and the city of Tucson are using roundabouts more often but drivers do not always agree roundabouts are a good way to go. "I really hate them, says Steve Gutierrez, “I think they're hard for people to navigate and it's just frustrating because people they start honking at them and you don't know what lane you're supposed to be in. It just has no place. It's weird." Albert Letzkus says roundabouts do require driver courtesy and some time to get used to. But after a month or two drivers often say they like them.